A bumper crowd at Donington Park’s Convoy in the Park event were treated to 10 races of thrilling action over the weekend of 21-22 July, with the leaders of both divisions strengthening their grip on the title battles. Ryan Smith extended his lead in the Division One championship with another strong showing at Donington, with the MAN driver taking another five podium finishes. But although Speedy Smith opened the weekend with a trio of victories at his ‘home’ track, the Mansfield man didn’t have it all his own way: David Jenkins and Jamie Anderson (both MAN) scored one apiece on Sunday despite a hefty coming together earlier in the day. But with one runner-up and one third place to add to his hat-trick of wins Smith was at the heart of the action in every one of the five fiercely-contested Division One outings, and now holds a comfortable 48 point advantage over nearest rival Jenkins. The ever-improving Anderson lies third and has closed the gap to Jenkins to just 16 points. At the beginning of the weekend, Smith had to work hard for pole position: his fastest lap in qualifying was just 0.191 seconds quicker than Jenkins. But in the opening race the reigning champion appeared to have everything well under control, delivering a flag-to-flag win and pulling some four seconds clear of runner-up Jenkins by the finish, with Stuart Oliver (Volvo) taking the final podium spot. Anderson, another Donington ‘local’ looked set for a fine fourth place – but penalties for exceeding track limits dropped him down the order and promoted Shane Brereton (MAN) on his return to the series, having been racing in the European series this season. Anderson looked set to make amends in race two – blasting into an early lead while Smith fought his way from the back of the grid to eventually engage in a duel with Jenkins. It only took five laps for the rampaging Smith to move through into second spot – and although he crossed the finishing line just behind Anderson there was another winner’s trophy waiting for him; Anderson was judged to have made a jump start and collected a 10-second penalty, dropping him to eighth in the official results. Jenkins too was penalised (track limits) – and with five seconds added to his time dropped off the podium, allowing Brereton and Terry Gibbon (MAN) to take second and third respectively. The action was fast and furious on Sunday morning in race three. Smith again started from the back of the reversed grid – but soon sliced his way through to the front, finally overhauling early leader Simon Reid, who’d put on a strong showing in his Iveco. Jenkins had been fighting it out at the front with Anderson – but as the two black MANs came together at Redgate corner Anderson spun, dropping down to sixth while Jenkins, second on the road, was excluded by officials. Brereton gratefully joined Smith and Reid on the podium. Anderson’s luck finally changed as he charged to victory in the fourth race of the weekend, thereby ending Smith’s winning streak. Leading from the opening lap Anderson had to fend off the experienced Oliver – but the Volvo driver also had to keep his eyes on the mirrors with Smith closing in for a late challenge, just 0.7 seconds splitting the pair at the chequered flag. The last of the Division One races was a real thriller; Luke Taylor (MAN) took an early lead and was running strongly in front for five laps until hard-charging Jenkins found his way through. That man Smith was also on the charge – posting fastest lap – and was soon sitting on Jenkins bumper. But Jenkins was determined to hold off his rival and fended off every challenge to claim the win, crossing the line just 0.6 seconds ahead after 11 frantic laps. Brereton performed strongly to collect another third place – but Taylor slipped back to eighth as Oliver, Reid, Anderson and Gibbon all blasted by in the closing stages. There was no stopping Luke Garrett in Division Two as he took a clean sweep of five wins – the MAN driver storming to the front to score convincing victories even in the four races where he’d been relegated to the back of the grid! 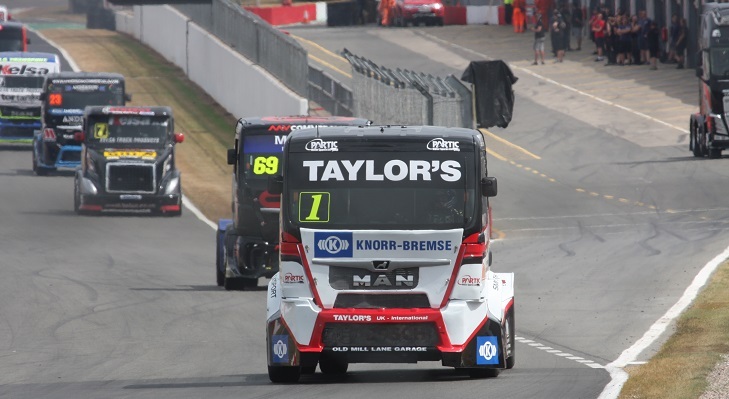 Adam Bint (Volvo White) came closest to matching the pace of Garrett, finishing just 1.474 secs behind in race two – but by Sunday’s final race the depleted field of just six trucks trailed home nearly 15 seconds adrift. The consistent Brad Smith (Daf), taking two second places and three thirds, retains second in the championship as the teams take a much-needed summer breather before round 6 at Snetterton in Norfolk over the weekend of September 8/9. 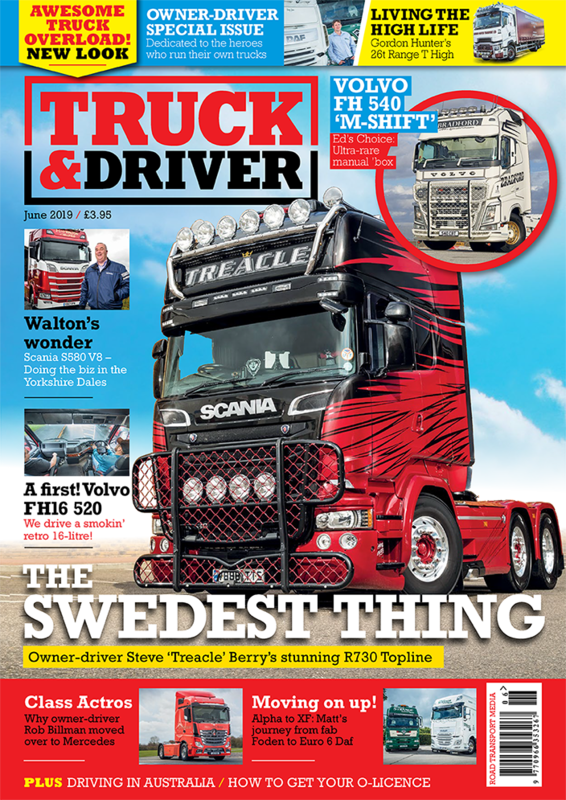 There will be a full review of Convoy in the Park in the September issue of Truck & Driver, on sale 14 August. To find your local stockist, click here. If you want to subscribe to the magazine, you can take advantage of our great off to get 12% off the price of a year’s subscription, plus get a great free gift. Click here to find out more.